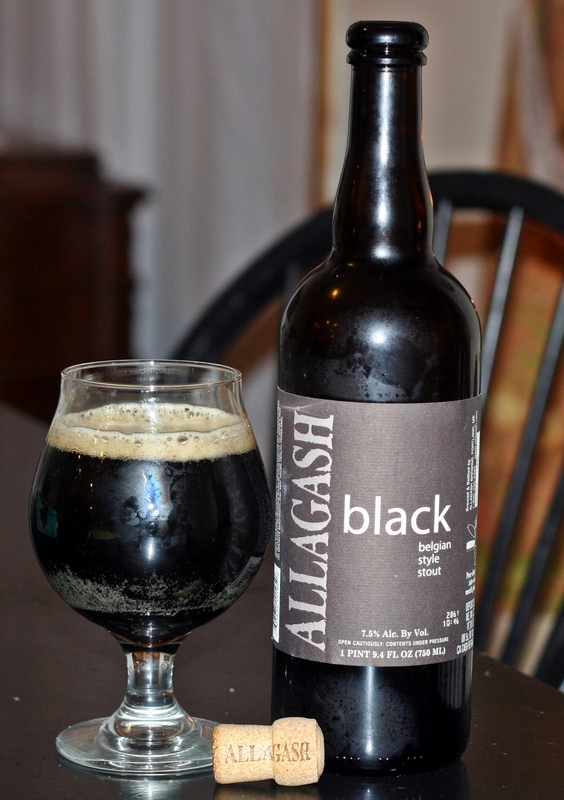 After reviewing some of Allagash’s more expensive limited and specialty beers I decided to open a bottle of Black. This beer is one of six that are available year round from Allagash and it is available in both 750 ml bottles and recently released in 12 oz bottle 4-packs. Appearance is well black…. no surprise there. Nice thin tan head that leaves a fair amount of lacing. Let this beer warm up a bit before drinking and you will get plenty of chocolate and a little coffee in the aroma. The Belgian yeast works very well with the roasted flavors of the stout. Body is what you would expect from a stout with fairly low carbonation, slightly heavier than the other beers reviewed from Allagash leaving a light film in your mouth. As with the others from Allagash this is a complex beer and if you don’t enjoy the first taste let it warm and try it again. Brewers Description: Allagash Black is a Belgian style stout brewed with 2 Row barley, torrified wheat, oats, both roasted and chocolate malt and a generous portion of dark caramelized candi sugar. The silky mouth feel is a great balance to the roasted character, coffee and dark chocolate notes expressed throughout this beer.